The bombing of Osaka during World War II first took place from the middle of the night on February 26, 1945, to the early morning of the next day. There were also bomb raids on March 13, 14, June 6, 7, 15, 26, July 10, 24, and August 14, the last day of the war. It is said that more than 10,000 civilians died in these bombings in Osaka, Japan. Osaka was the second largest city in Japan, with a population of 3,252,340 in 1940. Traditionally, it was the most important industrial concentration in the Far East. Osaka was one of the principal centers of heavy industry, noted for its shipbuilding, iron, steel, rolling stock works, as well as non-ferrous metals enterprises (notably copper and aluminum). In addition, it was outstanding for its production of aircraft propellers and governors, munitions and ordnance, textiles, special steels, wires, electrical equipment, chemicals, instruments, and machines and machine tools, particularly anti-friction bearings. It had also become a transportation center, and ranked third as a port. Much work had been done to develop its naturally shallow harbor. Lastly, it was the center of an extensive system of railways. The first air raid on Osaka lasted for about three and a half hours from 23:57 on March 13, 1945 to 03:25. 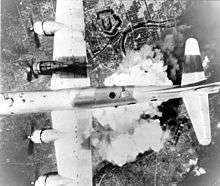 A total of 274 B-29 heavy bombers attacked Osaka. At first, 43 bombers of the 314th Bombardment Wing flew from Guam island. It was a low-level night raid from an altitude of about 2,000m aiming at the local civilian housings. The pathfinder dropped napalm bombs at a target in Minato ward and made a conflagration. The following bombers dropped incendiary cluster bombs around the point. Then, 107 bombers of the 313th Bombardment wing arrived from Tinian and attacked Naniwa ward. Finally, 124 bombers of the 73rd Bombardment Wing from Saipan arrived and attacked Kita ward and Nishi ward. This bomb raid resulted in 3,987 dead and 678 missing. There were 274 aircraft that dropped a total of 1,733 tons of bombs on the primary target (Osaka urban area). One B-29 bombed an unknown target and one bombed Chichi-jima. Five B-29’s bombed Ujiyamada, Kobe, Shirama, and Kushimoto. The destruction of Osaka was almost entirely concentrated in one area southwest of Osaka Castle. Total damage amounted to about 8.1 square miles destroyed. Thirteen numbered targets received damage. Two U.S. aircraft were lost. One was lost from an accident and one from an unknown reason. The U.S. suffered no crew member casualties during this mission. The aircraft lost from the accident crashed and burned on take-off, but all crew members escaped. The eighth bomb raid was executed on August 14, 1945, the day before the end of the war. Approximately 150 B-29's raided Osaka. They dropped about 700 1-ton bombs, targeting the Japanese Army's factories in Eastern Osaka. Four units of 1-ton bombs were also dropped onto Kyobashi Station of the Japan National Railway nearby around 1pm, resulting in substantial damage to the civilian-filled station. This air raid was also called "Kyobashi Station Bomb Raid". There were two trains that had just arrived at the station when the bombs were dropped. The victims of the air raid in this station counted more than 210 dead civilians identified, more than 500 unidentified. XXI Bomber Command, Tactical Mission Report, Mission #42, 13–14 March 1945.